Your pancreas, a gland located behind your stomach, produces digestive enzymes and insulin, which controls blood sugar. Pancreatitis is an inflammation of the pancreas that can cause tissue death and bleeding in or around the gland. Excessive use of alcohol, including binge drinking, is one cause of both acute and chronic pancreatitis. There also may be a connection between alcohol and the risk of pancreatic cancer. The effect is the same whether the alcohol is in beer, wine or liquor. Pancreatic fluid, which transports the digestive enzymes produced by the pancreas, flows through the pancreatic duct, which extends the length of the gland. The duodenum, the part of the small intestine closest to the stomach, surrounds the head of the pancreas. The bile duct, which originates in the liver and carries bile to help digest fat, also extends through the head of the pancreas and joins with the pancreatic duct at the ampulla of Vater, where they both empty into the duodenum. Acute pancreatitis has severe symptoms and occurs suddenly. Symptoms include upper abdominal pain that may radiate to the back or chest, rapid heart rate, shortness of breath, nausea, vomiting, sweating and fever. Recurrent attacks can eventually damage the pancreas, resulting in diabetes or malnutrition because of problems digesting your food. One risk factor for acute pancreatitis is binge drinking or regular excessive consumption of alcohol. Chronic pancreatitis is an ongoing problem with generally milder symptoms, including stomach pain, nausea, food intolerance and oily stools. You may have bouts of severe abdominal pain, while at other times, you may have minimal or no pain. Chronic pancreatitis eventually damages the pancreas to the point that it can no longer produce adequate insulin and digestive enzymes. Alcohol abuse is the most common cause of chronic pancreatitis. Pancreatic cancer has the lowest five-year survival rate of all cancers, and it can be difficult to diagnose in the early stages. A University of Texas Southwestern Medical Center study suggests a link between heavy and binge drinking -- defined as five or more drinks -- and an increased incidence of pancreatic cancer in men. The men who drank had a 1.5 to six times higher risk of the cancer, regardless of when the heavy drinking had occurred, than men who didn't drink or drank less than one drink per month. 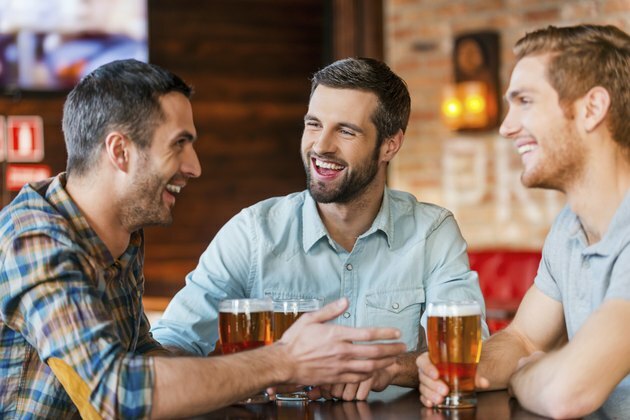 Men who engaged in binge drinking had a 3.5 times greater risk. The study did not find the same link in women, but fewer women reported excessive or binge drinking. To avoid pancreatic damage, drink beer and other alcohol in moderation or not at all. Moderate drinking is no more than one drink per day for women and two for men on any single day. It does not mean it's OK to drink more on one day, then abstain for the next few days to average the recommended amount. If you have a history of pancreatitis, avoid alcohol entirely to minimize symptoms and prevent further damage.